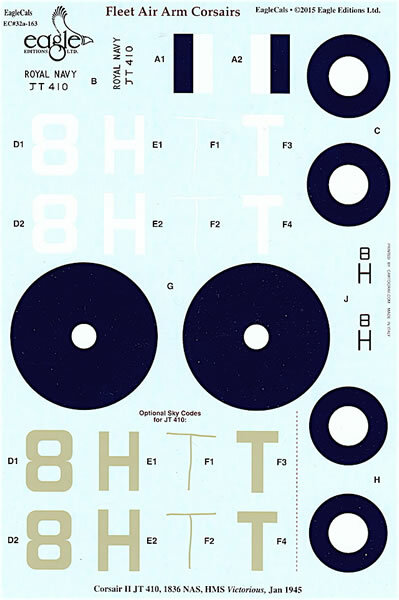 Contents and Media: Set contains three waterslide decal sheets of national markings, codes and other aircraft-specific markings and one double-sided A3 fold out full-colour instruction sheet with marking options for three aircraft. Advantages: Interesting subjects; comprehensive instructions; high quality Cartograf decals. Conclusion: Corsairs look great in FAA colours, and the schemes EagleCals have chosen here are no exception. Highly recommended. 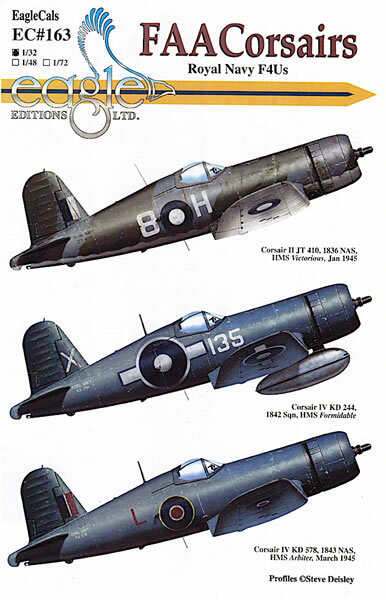 Rounding out EagleCals’ comprehensive range of F4U decals is this 2015 release devoted to Royal Navy Fleet Air Arm Corsairs. 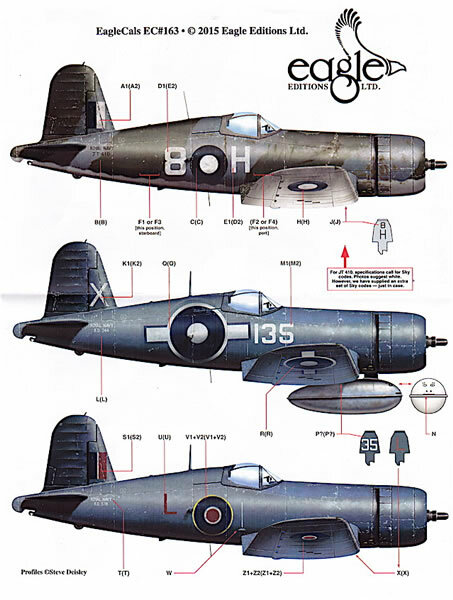 The set is something of a sequel to EagleCals’ earlier ‘Birdcage Corsairs Part 3’, which included markings for two FAA Corsair Is. This release features later subtypes – one Corsair II and two Corsair IVs – and like the other releases is available in all three major scales, with the 1/32 set being reviewed here. Corsair II, 8-H/T8-H/JT 410, flown by Sub-lieutenant Donald ‘Don’ Sheppard RCNVR of 1836 Naval Air Squadron, HMS Victorious, January 1945. Camouflage was ANA 613 Olive Drab and ANA 603 Sea Grey upper surfaces over ANA 610 Sky lower surfaces. 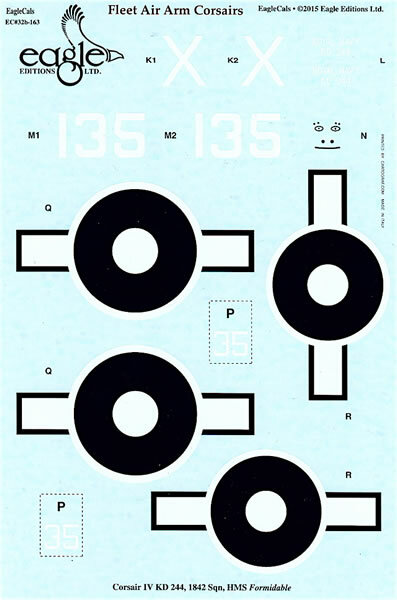 Blue-and-white SEAC roundels were likely carried in six positions, although the instructions note the suggested wing markings are provisional only. JT 410 underwent several marking changes – from ‘8-H’ to ‘T8-H’, with the T initially just chalked on the fuselage before being painted in the correct dimensions. EagleCals provides markings for all of these changes, as well as the option of white or Sky codes. Corsair IV, 135/X/KD 244 of 1842 NAS, HMS Formidable, 1945 (date is not stated in instructions, but likely based on HMS Formidable’s 1945 deployment). This and the following Corsair were finished in the standard late war USN camouflage of overall Gloss Sea Blue (FS15042) with a Flat Sea Blue anti-glare panel on the upper fuselage. 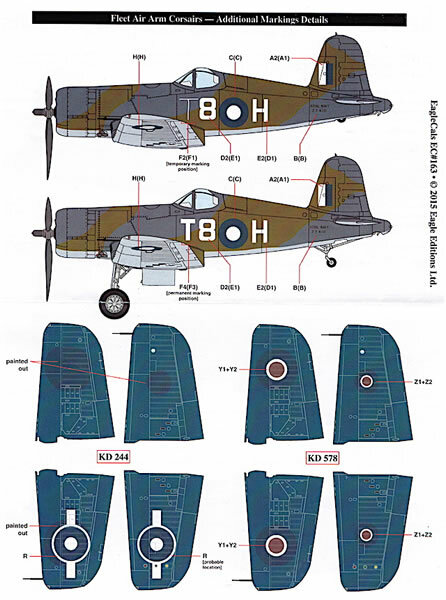 Blue-and-white roundels with bars on fuselage sides and port upper and starboard lower wings, with original non-barred roundels overpainted on all four upper and lower wing surfaces. Corsair IV, L/KD 578 of 1843 NAS, HMS Arbiter, March 1945; red, white and blue roundels in six positions. EagleCals’ profiles suggest that all of these aircraft were reasonably weathered – not surprising given their operating environment – so to assist with painting and finishing I’d recommend tracking down period photos of your chosen subject. The decals are by Cartograf and look as good as you would expect from this company. 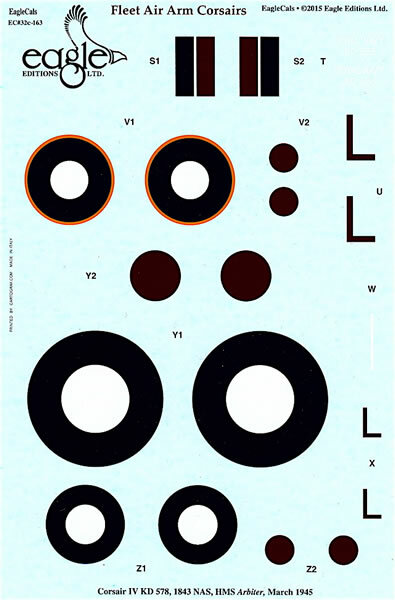 The central red dots for KD 578’s roundels are provided separately to avoid printing registration issues, but in my experience such multi-part roundels are easy to apply so long as you take your time. A nice touch is that the decals are printed on three sheets, one per aircraft, which means markings aren’t crowded together and every attempt to cut out a decal isn’t fraught with danger. 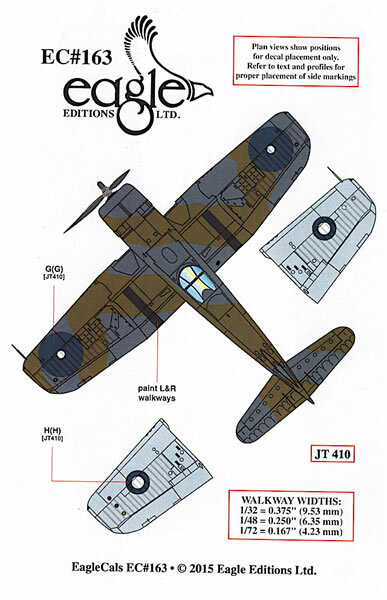 a brief written description of each aircraft that includes information about the pilot (where known), unit, colours, markings, stenciling, and references. Corsairs look great in FAA colours, and the schemes EagleCals have chosen here are no exception. The clipped wings of British F4Us mean that – depending on your chosen kit and scale – you may need to do some conversion work to accurately depict your subject, but the amount of effort required to achieve this is reasonably small. While at this stage I’m still planning on finishing my 1/32 Tamiya kit as an RNZAF F4U-1A, I’m also seriously tempted by Sheppard’s code-shifting Corsair II from HMS Victorious.